Joe Biden’s red, white and blue home page is dominated by news and a series of slide shows as well as opportunities to make financial contributions. There are four different opportunities just on the homepage, one of which is an attention-grabbing red button placed in the middle right hand side. His campaign blog is frequently updated with an an average of six new posts a day. Well organized, tech-savvy and active, the first thing one might notice about this site is that the candidate is called Hillary—the word Clinton is absent. There are “8 Things You Can Do,” from “Join Team Hillary (i.e. sign up for emails and give personal information), to “Be A Hillraiser” (i.e. fundraiser), “Join/Start a Group (social networking) to “Start a Blog.” Also featured are videos, her blog and the latest news, (the site averages three new pieces of content daily). Much of the content speaks to her take on issues—even though she was the only candidate with no dedicated issue section until late May 2007. As someone who was left out of all the Presidential debates by cable news channels, much of the focus of John Cox’s Web site is to establish first, his identity and second, his credibility. A picture of him dominates the upper half of the home page, followed by a video of a television interview in New Hampshire headlined, “The Man Who Wasn’t There: Candidate for President.” Overall, the Web site remains pretty static day-to-day with only infrequent updates. Cox is also one of only two candidates who do not participate in the world of social networking. In May, Chris Dodd’s campaign Web site seemed technologically undernourished. By the end of the month, his campaign must have come to the same conclusion. In a late May redesign, his blog became much more active (going from an average of less than one post a day to over three), he added video and became more active on the social networking circuit. It now emphasizes video and how to join the “Dodd Squad.” With the redesign, however, the site, done in the most typical red, white and blue, also dropped some features, including Spanish language translation of content. The continuously revolving slideshow that dominates John Edward’s home page gives the site a very active feel from the start. The action continues with a vast “Multimedia” section including video, audio, podcasts, photos and more as well as a “Take Action” menu item with 13 separate ways to get involved and links to 23 social networks sites. The site also stands out for forgoing the usual red, white and blue pattern. Here, the national colors are combined with yellows and greens. Jim Gilmore’s Web site lacks some of the sophistication that defines the Web sites of the leaders in the polls. Users are immediately greeted by a video introducing the candidate seated at a desk, “I’m Jim Gilmore, former governor of Virginia….” He updated the site in early June to add more interactive and customizable features like offering users the chance to create their own blogs, joining and creating online community groups and fundraising. But overall, the site is primarily comprised of more traditional text features like news and blog post headlines. 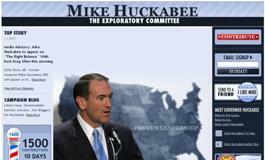 The only individual in the study whose candidacy is still in the exploratory stage, Mike Huckabee’s Web site is spartan in its layout and content. There is no top menu bar, and instead, a nearly screen-size image of the candidate looms in the center of the homepage, flanked by two sidebars that contain links to the other components of his site—including his blog, stand on key issues and a biography of him and his wife. He is the only candidate to offer no links to mainstream media and one of the few with no social networks highlighted. Like those of other candidates trailing in the polls, Hunter’s site has few frills, essentially functioning as a way to build his base and get his position across. His lead item (‘latest news’) is always an opinion poll that reflects his stance on an issue and asks visitors to vote for or against his stance. His three key issues are also upfront, as is an endorsement from legendary test pilot Gen. Chuck Yeager. Other than that, the home page is dominated by ways to get people involved—with appeals for contributions leading the pack (indeed, donating money to Hunter qualifies you to be an “eDonor Leader”). Hunter distinguishes himself as the one candidate Web site that doesn’t have RSS. Kucinich’s site is aiming for substance over style. Text heavy, with minimal graphics/visuals, the home page displays all new content chronologically down the middle – almost blog like. Flanking this main column on either side are ways to contribute and state-level campaign efforts (using a very crude map). One of four candidates who doesn’t have a blog, he instead boasts an active, if confusing, “forum” – a virtual town hall where visitors can discuss issues at will. Kucinich does, however, make the most of YouTube and has one of the most exhaustive issue sections (covering 91 topics in all). 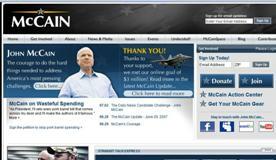 One of the four sites not to feature a red, white and blue color scheme (opting instead for a black, gray and white motif), John McCain’s Web site is packed with information—to the point of being overwhelming. Video plays a heavy role on the front page, and has its own well-organized “Multimedia” archive. Also highlighted is a slideshow of stories from the campaign trail, his “Straight Talk Express.” McCain’s web campaign staff seems to be increasing the number of ways to get voters engaged. 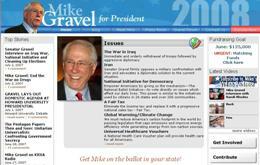 Between May and June 2007, several citizen-centric sections were added including “Involving You,” “John McCain Supporter Spotlight” and a poll, as well as information on how to register to vote. Barack Obama’s site suggests inclusion. The site focuses on community involvement, from citizen stories and pictures, to community blogs, to viewer-submitted videos. It is frequently updated with new content, featuring a new lead story in the upper left-hand corner every day, if not more frequently. 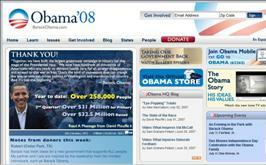 In fact, even the layout of the page shifts frequently, though the core features remain the same: “MyBarackObama.com,” “In the News,” “BarackTV,” “Obama HQ Blog” the Obama store and upcoming events. The site is among few that are offered in Spanish and help citizens register to vote. Governor Richardson’s site stresses outreach and image-building. The home page is split between the many ways to get involved (volunteering, social networking, attending speeches) and the many things the candidate is up to (in the form of video, news or blog posts). 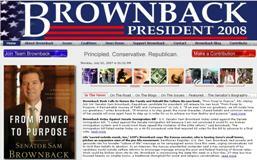 Richardson confirmed his foray into the presidential race on May 21, 2007 and his site saw a consequent makeover. By June, he had added new sections (Multimedia, for one), energized his blog by allowing comments, allowed for user customization of the page and changed the color scheme from dark red to a more ‘patriotic’ blue Star – Spangled Banner look. Tom Tancredo’s site is clearly laid out to emphasize one, who he is and two, where he stands on key issues—especially illegal immigration, which gets its own menu-section. Dominating the home page is a large picture of Tancredo accompanying the “lead” story that could be either a recent campaign event or an issue statement. Options for involvement are limited to appeals for donation and e-mail alerts. His blog is tucked away on a tab at the top of the page, and it’s here that you find links to social networks. Tancredo offers a branded video channel, “Tom TV,” that streams selections of mainstream media appearances. 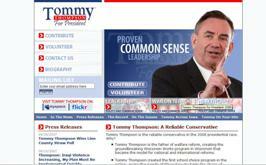 Another no frills site, Tommy Thompson’s site seems, instead, to be focusing on establishing his identity. The home page is dominated with an image of him along with the campaign theme of him being a “reliable conservative” who has “proven common sense leadership” and a profile of his appears just below. 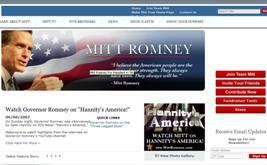 In terms of features, the campaign Web site stands out more for what it lacks than what’s present. With no video, no blogs of any sort and only the minimal delivery options, Thompson’s site scores low on both on-demand access and voter engagement.